super greens, flax, and chia are great additions to a morning shake. A lot of people ask me how I can maintain a figure while being so busy. Between working a full-time job, running 2-4 writing jobs on the side, raising 4 kids, and being a wife– one can wonder how I’m able to still eat healthy. We all know how much easier it is to run by a fast-food restaurant or to microwave a Cup o’ Noodles when we have only so much time for ourselves. And I know plenty of busy parents who just don’t eat breakfast– a hot cup of coffee is all they want or have time for. I myself have been there. Coffee for breakfast. Cup O’ Noodles for lunch. Yep. But it’s not healthy. We all know it. But how do we add more minutes to our day? I certainly don’t have time to sit down for a morning bowl of oatmeal, let alone an omelette. And then I decided to try the morning shake. Now this works! The issue has been finding the right type of food to put in my shake so that I get the nutrition I need and remain full enough to only need a snack around 10 until my lunch at noon. But also is simple enough so that I don’t spend longer than a couple of minutes to make it before I run out the door and drink it on my way to work. Some mom’s I have talked to just put fruit and veggies in their morning shake. I cannot do that I don’t recommend it for most people. That will just shoot up your glucose levels and send them crashing down within 2 hours. You will feel weak, disoriented, and tired. You need protein. And believe it or not, you need fat for satiety and energy. Do not skip these in your morning shake. Don’t worry, you won’t even taste these in your morning shake if you add the protein powder or meal replacement later. I get mine from Costco because it’s a huge bag and is triple washed. To make sure it lasts through the couple of weeks it takes me to go through it, I stick it right in the freezer. 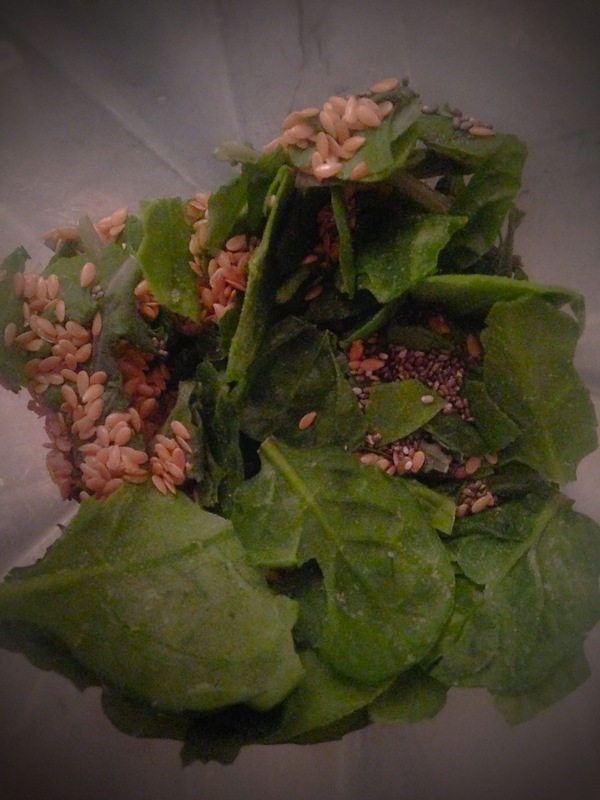 Then I grab the bag in the morning and pull out 2-3 handfuls of the frozen leaves and throw it in my blender. Added bonus– less ice needed, if any. 🙂 If you choose not to use protein powder or meal replacement, I recommend adding Stevia, Monk Fruit, or Agave to sweeten the shake up a bit and cover the earthy flavor this will provide if your palate does not care for green beverages. My favorites include frozen blueberries or strawberries or banana. I also really like butternut squash! (Add some cinnamon!) While fruit certainly adds vitamins and other nutrition to the shake, my big reason for adding it is for the flavor variety it offers. Try not to put too much in though, because fruit does have a lot fructose in it (Blueberries and butternut squash offer the least); however, if you do not use protein powder or meal replacement (which usually is sweetened) then add more fruit to balance the green superfood and make it more palatable. Whatever the fruit option is for the week or two that I have it, I make sure that it is in a bag, frozen in the freezer. I buy the berries already frozen from Costco. Bananas take just a few minutes to peel and chop on a Sunday afternoon. Then I throw them all in a freezer bag and I’m set up for the week. I put mine in whole, but I have a Vitamix blender which can blend it. If you don’t, I recommend buying them already ground. I buy mine at my local natural foods store from the dry bins. Its cheaper that way and fresh. 🙂 These are packed with protein, more omega 3 fatty acids, and add added fiber to your diet. This is great for cleansing and detoxing! Coconut oil is a medium-chain saturated fat. Don’t get scared about the saturated fat part. If it is medium-chained, it goes straight to the liver for instant energy–and is not stored in your body. It will help you stay full longer, give you added energy, and as a great bonus– coconut oil is a natural anti-viral, so it will help keep your immune system strong. The coconut flavor is a nice addition to the morning shake as well. 🙂 Don’t forget– fat is essential for hormone balance, ladies! And it takes fat like this to burn fat. Don’t skip on the fat! You need it! 30% of your daily calories should actually be from healthy fats. Now it doesn’t take much of it to make up 30% of your calories so don’t go overboard. But don’t buy into the lie that you need to go fat free to get slim. It just ain’t true. 🙂 Costco (Do you see a pattern here? ) sells a great quality Coconut oil that is organic, virgin, unrefined, and cold-pressed– all important for the health benefits of coconut oil. I get this from a variety of options: Whey powder, Greek-Yogurt, Peanut Butter, and/or Raw Egg. Whey Powder–This is my favorite. You can get a whopping 25-30 grams of protein which is ideal for your breakfast launch into the day. They come in great flavors like chocolate, vanilla, or strawberry. I prefer vanilla because its more versatile. And its the quickest way to get the protein in your shake and you out the door. But if you don’t like that option–there are some whole food options I also enjoy–they just add a few more time. I’m not advocating any particular brand. There are many good ones out there. And you don’t need whey if you don’t like. There is pea powder, soy powder, creatine…so much variety out there. I prefer whey because it is affordable, tasty, and doesn’t hurt my belly like casein, and doesn’t add estrogen like soy will. Greek Yogurt is also a great option. In one cup of Greek yogurt, there is 20 grams of protein. Most come non-fat, but you can find some with low-fat or full fat. If you get the full fat or low-fat, you may not need the coconut oil (although it won’t hurt). I usually find this much yogurt too much for my shakes, so I usually cut it to half a cup and then add peanut butter to cover the flavor a bit. Peanut Butter--There is 4 grams of protein in every tablespoon of peanut butter. So supplementing the yogurt with 2-3 tablespoons of peanut butter work too. This takes more time than the whey powder, which in one scoop is done– no tablespoons or measuring cups needed. Raw Egg is another great option. Don’t be afraid of all those “raw eggs are bad for you” crap. Did you know that you don’t even need to refrigerate raw eggs when in the shell? Yes–we are still listening to wives tales. Do the research. Or trust me– raw eggs in your shake are just fine. Just drink it in a timely fashion. Don’t let it sit all morning and then drink it. There are 6 grams of protein in a large egg. So again–this works as a great supplement to the yogurt or peanut butter. While the above is certainly enough for a good morning shake, my husband finds that by adding the meal replacement powder, it gives him added satiety and more nutrition from the additions it brings in. There are a lot of good brands out there that work– Shakeology is the most expensive, but whole-food based and very delicious. Juice Plus is also non-GMO, whole-food based, and delicious. Herbal Life I finds keeps me fullest the longest and has a lot of really delicious flavors–although it is not whole-food based so you will get synthetic vitamins added in and GMO based nutrition. I grab the bag of frozen super greens, throw in 2-3 handfuls. Then I grab the bag of frozen fruit and grab a handful of that. Next I grab the two bags of seeds out of the refrigerator and open the bags and grab about a tablespoon out of each using my fingers as a scooper. Next I grab my protein powder and scoop out a serving using the scoop the brand provides and do the same for the meal replacement. I finally add some non-fat, sugar-free rice milk or almond milk (1-1.5 cups if I’m making it just for myself, and 2.5-3 cups if I’m making it for my hubby too). I blend on high until it’s all blended and the seeds disappear. I quickly poor it into a 16-20 oz cup, rinse out the blender real quick in the faucet and then head out the door. I drink on my way to work. What are some of your favorite quick morning shakes for breakfast? Check out these great morning smoothie recipe books for other options! Yes! I love my Magic Bullet for single servings like this. Let me know what you think of it, Crafty Coin. Will have to check your blog out more often. I’m always up for a deal and had no idea Trader Joes had such a good deal on good quality coconut oil. 🙂 Love Trader Joes! Yes!! Trader Joe’s has some great finds. The price on their fresh cheese is hard to beat too! !